Who loves jewelry? Would you be able to fill this? 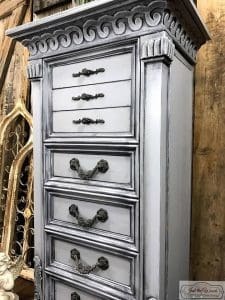 Personally, I don’t have enough jewelry to fill this beauty up, by I’m sure my 4-year-old would fill it with per play tiaras and plastic rings in a heartbeat! 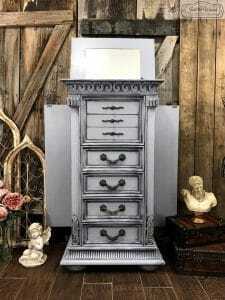 This jewelry chest was brought in by my customer for a new look. 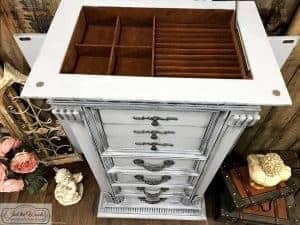 The original finish was a yellowish cream, with great details and plenty of storage for more jewelry than I could ever imagine owning. Disclosure: This post contains affiliate links for your convenience. Click here for my full disclosure policy. 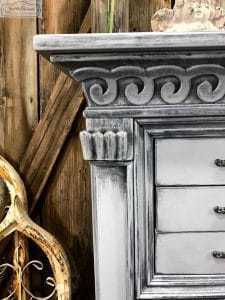 My customer sent me inspiration photos from Pinterest of a weathered gray, distressed, gustavian style painted finish. 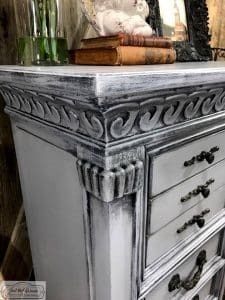 She was looking for a much different look from the original creamy yellow, and a layered gray will really bring out those amazing details. 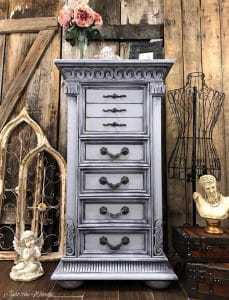 When the piece was dropped off, my customer mentioned that one of the side storage doors of the jewelry chest sticks. 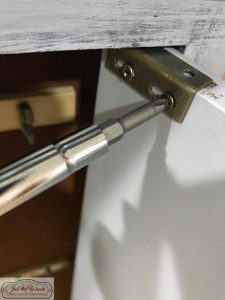 While trying to adjust the door I discovered that the existing hinge was broken and needed to be replaced. Both side doors were then removed for easier access to paint and the mirror was taped over for protection. 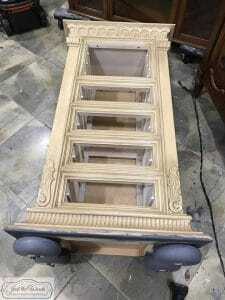 The entire piece was sanded and cleaned, and the felt interior was vacuumed before starting (and again after). 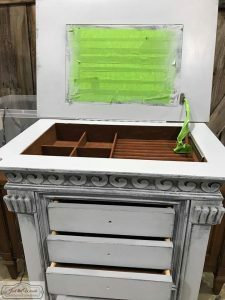 Here is my entire process for How to Prep Painted Furniture. 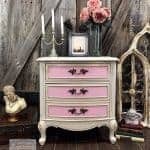 To get started, I then laid the jewelry chest down to allow full access to the bun feet. I actually made a note to myself of exactly how I finished the bun feet to make sure I did the same thing to the rest of the jewelry chest. 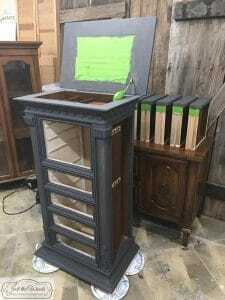 Once the feet were completed and sealed I stood the chest back up to continue. 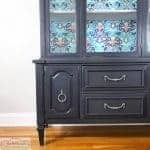 The entire chest was first painted in the leftover charcoal mix that I had used on my previous china cabinet. 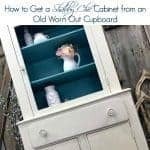 You can see that Vintage China Cabinet if you’re curious. The dark charcoal was then covered with a gray tinted glaze, more so in the corners and crevices. In between coats I lightly sanded with my fine grit flexible sandpaper for a super smooth finish. 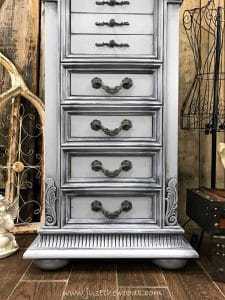 Then the entire jewelry chest was brushed with a light gray paint. 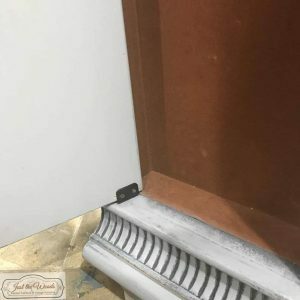 Switching back and forth between a damp scrubby sponge, and my flexible sandpaper, I then wet sanded the entire piece, paying extra attention to the raised details. The entire piece was then sealed first with a clear sealer followed by a gray tinted glaze. 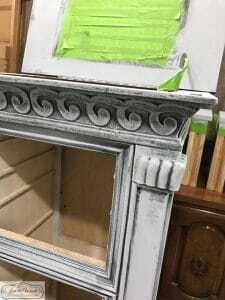 A little black stain was also added, using small artist brushes, particularly in the crevices for that worn weathered gustavian painted finish. 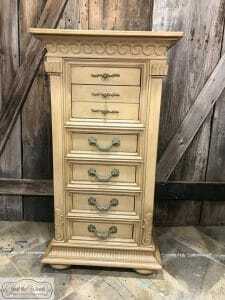 The original hardware on the jewelry chest was a gold tinted cream, which was appropriate for the original finish but was lacking with the new weathered gray painted finish. Along with contacting my customer to see what she wanted to do, I also posted to Facebook for opinions. 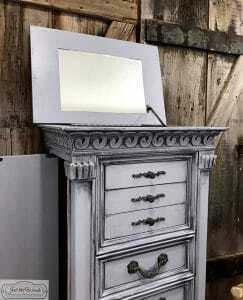 Many agreed that the hardware needed to be darkened up. 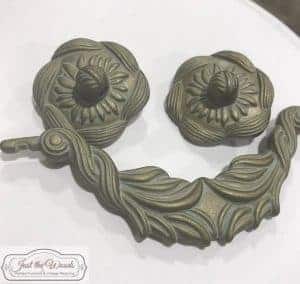 To darken the hardware without making it too dark, I simply brushed it with the custom mixed charcoal and sealed with a gray tinted glaze. 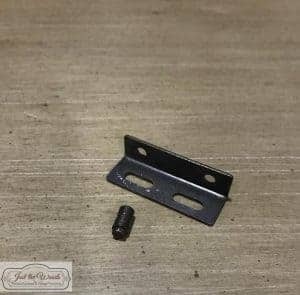 Remember that broken hinge? 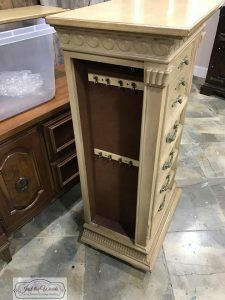 The new hinge is attached and the doors are put back onto the jewelry chest. 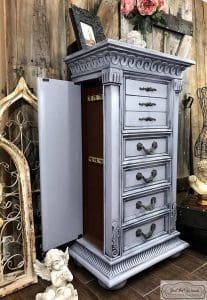 This weathered gray jewelry armoire is ready to head home and hopefully, fill up with some pretty and sparkly new things. 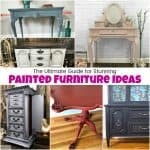 New to painting furniture and not sure where to start? 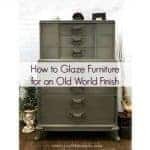 Start at the beginning with How to Paint Furniture – a Beginners Guide. Wait! There’s more! Let me introduce you to my friends. Let’s see what my friends are up to! 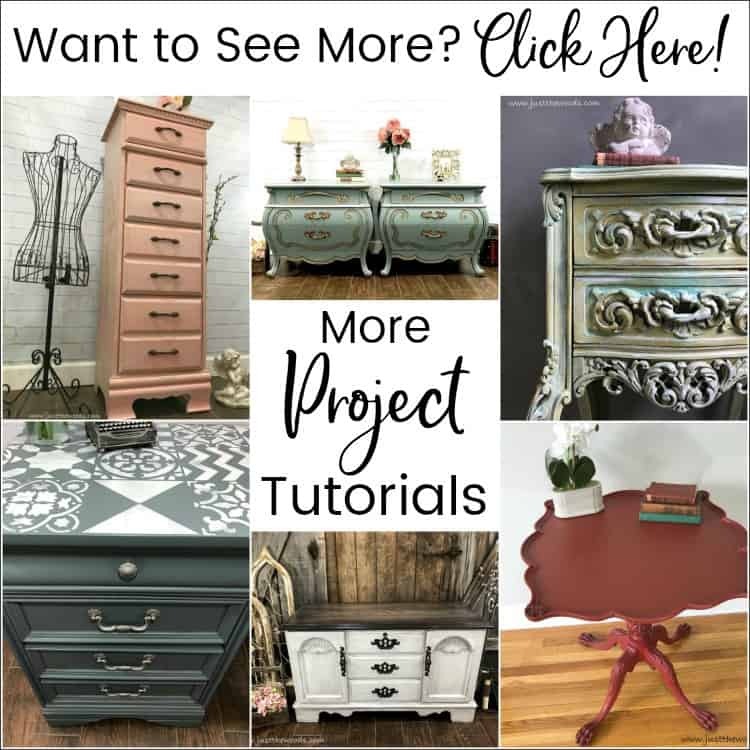 Make sure to click the links below the image to check out all the amazing projects that my bloggy girls are working on this month. 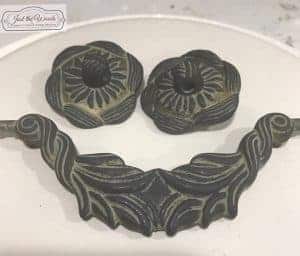 The glaze on this piece knocks it out of the park! And I love mixing custom colors too! Wow, Kandice! 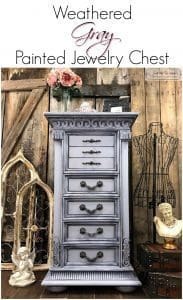 This jewelry chest is gorgeous! You do such beautiful work. Beautiful makeover, Kandice! Wow, love that patina. 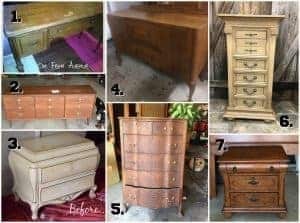 Sharing this so my sister can take a peek because she inherited my Mom’s jewelry chest and wants me to give it a makeover. 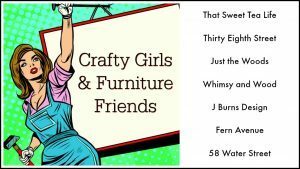 Meet the Artist – Hey there and welcome to my blog! I’d like to introduce myself. I’m Kandice – I’m a mom of two wild, happy, loud and full of energy toddlers, I’m a Navy veteran, I’m a wife and I’m the artist behind Just the Woods, LLC. 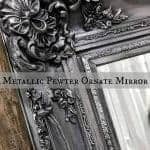 Click Here to get to know me better and visit my blog. All content on this blog is the property of Just the Woods, LLC. You are welcome to share my content (to include one photo only) as long as you provide a link back the original post. DO NOT copy entire posts, or crop, edit, or remove watermarks from photos without written permission from me first. Sharing a post from Just the Woods in a capacity where YOU will be compensated is not permitted. Thank you!